In this paper, geometric nonlinear analysis of pitched roof frames was carried out by the stiffness matrix method using stability functions. 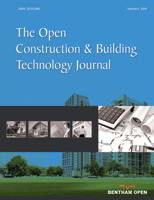 This study contributes to a better knowledge of the stability of pitched roof frames, not braced, and therefore of the efficiency in their dimensioning. At first, the argument of the stability functions was set as 0.01. The stiffness matrix of the frame has been assembled, as well as the nodal load vector of the frame. The boundary conditions (support restraint and wind bracing restraint) were introduced for the reduction of this matrix and the nodal load vector. At this stage, the determinant of the reduced stiffness matrix and the reduced nodal displacement vector are calculated. The argument of the stability functions is incremented by 0.01 and the operations are repeated until the determinant of the reduced stiffness matrix changes sign. The argument of the iteration preceding the sign change of the determinant and corresponding to its positive value is taken and refined by a process described in the paper. The buckling loads of the frame members are determined at this stage. The analysis focused on four frames; the obtained results show that the increase in the inclination of the crossbar makes it possible to take full advantage of the “arch effect”. Arch effect is due to the presence of crossbars which have a linear arch shape. Furthermore, the angle as well as the length ratio, between the crossbar and post, influence critical load value. Keywords: Geometric nonlinear analysis, Stiffness matrix method, Stability functions, Determinant, Buckling load, Pitched roof. © 2018 Bocovo et al.